I think if I see one more picture of the underwear bomber’s underwear, I will barf! It’s obvious that Amsterdam has very lax airport security. It’s not brain surgery…..just don’t allow planes from Amsterdam into the United State or any other lax country. Make them have to come or better yet, attempt to come, into the US by going through countries that have more structured security. I’m sure that all US airports are now attempting to be tougher going through security. Hello,……he did not fly within our country. TSA security is so different from airport to airport. The US cannot control overseas airports….but we can control planes flying into the US from foreign countries…..and not all countries will be able to fly into the US. The terrorists have inconvenienced US citizens enough! You can never control terrorists because they have no value on their lives….you can’t deal with people that have that mentality. But, it seems so logical to me that by controlling planes flying to the US, with lax security, it will put a hardship on that particular country and maybe they’ll jump on the band wagon and realize it’s not just a US problem; in other words, cooperate and be responsible! By the way, since the CIA had this info and deemed it not necessary to act on it, I would certainly hope that Pres. Obama fires some people. Like everyone that had knowledge of this and did nothing….hey, maybe we should deport them. They obviously have no regard for the safety of the US or it’s citizens. Isn’t their job to act on info they receive….just what does the CIA do to receive a paycheck? Just another rant….common sense people, it just takes some common sense sometimes to start the wagon rolling. I have the perfect solution, and I defy any politician to argue against it! Let every American citizen that pays taxes be entitled to the same health care that they are receiving! How can they argue against it? Better yet, why would they argue against it! Simple solution to a problem that they want to argue about forever!! Churning out the embroidery stuff…. Comments Off on Churning out the embroidery stuff…. 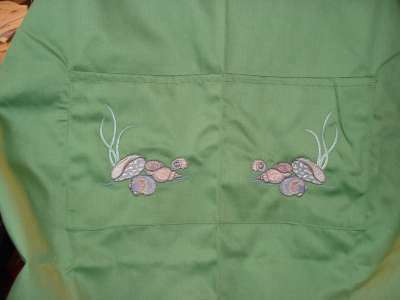 A friend asked me to do this apron for a friend of hers that lives in FL. Aren’t the shell designs delicate? 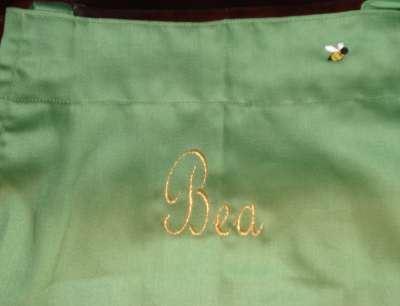 And with a name like Bea…well, it deserves a little bee on it! 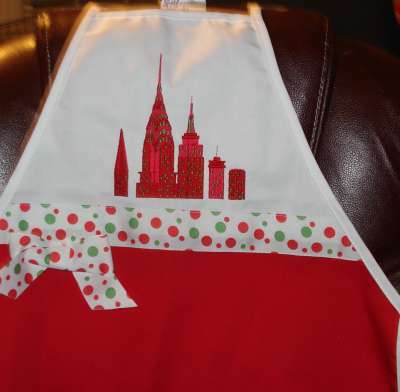 Daughter had me embroider the NYC skyline on one for a friend of hers that lives there! Turned out pretty cute!